Have you ever played Himmelsdorf against a team that has more heavies than you? Or perhaps, you’ve watched victory slip from your fingers on an open map simply because the other camp was lucky enough to have more medium tanks in their ranks. Update 9.20.1 clamps down on these frustrating scenarios by adding an extra parameter to the matchmaker: vehicle combat roles. Simply put, we taught the matchmaker to see the difference between the Maus and IS-7, for example. Now, it balances them separately. To create two evenly assembled teams, it would place the former against other heavily armoured tanks (the E-100, Type 5 HEAVY, etc. ), while the IS-7 gets to face the likes of the Т110Е5 and FV215b. Let’s take a closer look! Along with balancing teams by vehicle classes (artillery, light tanks, and tank destroyers) and Platoons, the matchmaker now looks into the intended roles each tank plays in combat and ensures each side has a similar number of vehicles that play the same role. Of course, their exact number might differ, but this difference is one vehicle at the most. NOTE: If you need a refresher on how the matchmaker works, head here. Essentially, the newly-added parameter balances out the number of autoloaders, well-protected TDs, and assault heavy tanks across teams. By distributing them evenly between the two camps, the improved matchmaker addresses another frequent concern of yours. Medium and heavy tanks are no longer distributed randomly. With classes split into smaller groups that unite vehicles with a district play style, medium tanks with a certain role are pitted against each other. The same with heavies. So you can forget about one-sided matchups with, let’s say, five Bat.-Chats duking it out with five Mauses on Steppes. We put in extra effort to make sure balancing by a vehicle’s role does not affect the overall speed of matching. So worry not, the wait time won’t change. What should improve is the overall quality of matches as vehicle roles lower the chance of a team gaining the upper hand through sheer luck. At the same time, team setups aren’t mirrored, so every battle is a unique experience where the final outcome depends largely on tactics and teamplay. Finally, the matchmaker tries to ensure teams are evenly assembled regarding the number of Platoon players and their vehicle tiers—its primary goal. However, it currently doesn’t balance Platoon vehicles by roles. Instead, it evens out the matchups by adding standalone vehicles to teams—if the current queue composition allows for it with no increase in the wait time. For example, if a team has a Platoon of autoloader medium tanks, the matchmaker places it against a Platoon of medium tanks. Then, it tries to add standalone autoloader tanks to the other team to even out their chances at victory. If there are no autoloaders in the queue, it will create a battle to avoid longer wait times. If you look at the way light tanks and arty fight, there’s no immediate value in breaking these two classes into smaller packs grouped around a certain role. Light tank gameplay is built around scouting, and that’s the role they all share, regardless of whether they remain completely still to spot enemies or zoom around the map. A particular set of LTs won’t make the enemy team superior to yours as long as both of you have them in similar numbers, and the matchmakers ensure you do. It’s the same story with SPGs: they all play as long-range support vehicles. TDs, medium and heavy tanks are a whole other story. Let’s take medium tanks with powerful guns and moderate armour, for example. These are designated support vehicles. Their peers, with strong protection but average mobility and firepower perform best in an attack role. There’s a whole bunch of medium tanks sporting autoloader guns, and they can dismantle an enemy in no time. Finally, others perform equally well in more than one role, which makes them fairly universal. Having analysed the key parameters and combat performance of TDs, medium and heavy tanks, we outlined primary roles for each class at Tiers VIII–X. The structure you see below is not final. We want to hear your thoughts on the classification and criteria we put at its core (armour, firepower, and mobility). Following your feedback, we might revise it and consider introducing roles for mid to lower tiers. Better chances of getting ranked at the top of the list for Platoon players: Initially, their chances of playing at the top were reduced to avoid upsetting scenarios with Platoons singlehandedly deciding the battle outcome. In direct response to community feedback, we’re raising them slightly so that you and your Platoon mates can fight at higher tiers once in a while. This won’t cause any drastic changes to the state of Random Battles, but offers a more varied experience to Platoon players. Equal chances of getting ranked in the top/middle/bottom of the list for different vehicle classes: You might have noticed that heavy and medium tanks would end up in single-level battles way too often, while arty and TDs tended to get ±2 and ±1 setups. We tweaked the matchmaker, evening out the odd for all vehicle classes. Optimized team assembly logic: After some extra tuning, you’ll see more 3/5/7 and 5/10 teams, which should provide for a more enjoyable experience. More Grand Battles: We increased the chance of getting matched in a Grand Battle, so that more players could playtest the new format. We put a lot of work into these improvements, and are excited to hear what you think about them. Your input is crucial as we continue evolving the matchmaker. So be sure to leave any suggestions or questions you might have on the forum. Q: When will be the HD maps be released? Will they all maps come in the same time? A: We are working as hard as possible on the HD maps at the moment. A lot of the maps are in the final stage, where the map developers are working on finalising the maps and stabilising the codes. Some of them are still in the process. Of course, when we release the HD maps, we will try to release as many maps as possible but we want to keep the quality of the map as high as possible. If some of the maps that didn’t make it into the release will be add in future updates. We want to make sure we have enough maps before releasing them so it does not have a significant impact on the matchmaking. Q: We notice there is a few new options in the graphic settings section (The sandbox we played on is in Russian, the wordings were translated with the help of WG’s translator- wordings can be slightly different in the live version) – Tessellation, Tessellation in sniper mode and improved physics, what does these do? Q: In the short time, we (community contributors that are testing the sandbox) conclude that Steppes north spawn needs some tweaking. Will the team consider changing it? A: Thank you for the feedback. We will make the map developers aware of that and we will collect the heat map and the feedback from the players on the Sandbox test server to decide whether further tweak is needed. Honestly it is hard to just copy and paste the old maps and put them in the HD map rendering. Q: Will there be new maps coming anytime soon? A: We know players want new maps, however, it is impossible to create new maps at the same time when we are in the process of converting the existing maps into HD maps. We are aware that we have no new maps for a long time (2 years). We have plans for new maps, but those will be after when HD maps is done. Q: What are the plans for new maps? A: At the moment, there are a few winter maps we are planning. We will replace some existing maps. I can also tell you there will be some rework on some of the current maps. Q: Will there be any maps remove from the game when HD maps come? A: Yes, some of the “Double Maps” will be remove from the game. Those will be Winterburg (Winter version of Ruinberg) and Winter Himmostolf. Fiery Salient will removed too in the game. Q: Isn’t it will be a good opportunity to also do map balancing changes when turning maps into HD? Q: What maps will be under rework? A: It is very important that when we are reworking the existing maps into HD maps, we try as hard as possible to make them to have the same playstyle as of the current maps, however, there are some minor tweaks to them as they are turned into HD. There are 3 maps that will have some obvious reworks, they will be Fisherman Bay, Erlenberg and Fjords. Q: How will those mentioned maps be changed? A: As of now, Erlenberg will have a massive rework, as we know the map is too problematic on the public server. For Fjords, we have plans to rework the middle section of the map. Lastly for Fisherman Bay, we are planning to add some hard covers in the fields (e.g. Mark I Tank corpses). HOWEVER, it is important to note that these are still work in progress, so there can be further changes. Q: Speaking of the game Performance, what will happen when the HD maps are introduced? A: We are working very hard to optimize the game for all kinds of computers. We are aware there is still a large number of players still using out-dated specs PCs. The minimum graphics requirement will stay the same for the time being, however we are planning to change the minimum requirement in 1 or 2 years’ time. Q: What will happen to mountain goating (boosting)? A: Mountain goating is more of a by-product when we introduced the new physics. When we introduce the HD maps, some of the locations will not be accessible anymore. There might still be some places still accessible, we will collect more feedback from the community to see if we will remove those places in HD maps. Q: In the sandbox test, I don’t see any winter maps, what happen to those maps? A: We are preparing some cool technology and effects for the winter maps. There are some cool technology that tanks will leave traces behind under the tracks, so tanks will be in the snow act like in real life (tracks will be in the snow). There is also a new ice shader that will makes the ice behave like in real life does. These effect will be optimised. We always try to optimize the game as much as possible so older hardware to work on the same level as of now or in some cases even increase performance. Q: How long does it take to change a map? Q: What will happen to some of the unpopular maps, such as the Kharkov and Stalingrad? Q: Some of the encounter and assault mode are problematic, will the balancing of the maps put these game modes into consideration in the future? A: Back a long time ago, players want us to increase the variety in random battles, therefore we introduced encounter and assault mode. However, there are some balancing issues in these 2 modes. It is very difficult to balance the map when we have to consider both modes and the normal random battle mode at the same time. We have decided not to touch these modes in the HD map rework. We are not planning to remove these modes from the games but at the same time we will not add further maps into these 2 game modes, as there are significant amount players that enjoy the mode. Q: What do you think about the Anime tanks (The Valkyria Chronicles Series Tank – Edelweiss and Nameless)? Some players think they are very overpowered. Q: There are many players dislike the current Type 4 and Type 5 HE guns. Will they be changed? What is this trend of giving more and more armour and super heavies to tanks? A: We are aware the players has very negative feedbacks on the Type 4 and 5 HE guns and the armour. However, at this point it hasn’t reach a critical point so we will not further change them for now. We are closely monitoring these 2 tanks. There are a lot of complains about armour being irrelevant in game, therefore deciding to increase the role of armour on tanks to make it a more significant role in the game. Q: How is the recently buff M48 Patton performing? A: Statistically, it is doing more or less the same. We will continue to monitor the performance of the M48 Patton, if the tank is over performing, we might tweak it later. Q: The current XM551 model looks very ugly, will it be changed? A: Yes! We are planning to replace to current Sheridan model to another one next year. One looks less silly. Q: Are there any plans for Object 430? The tank isn’t very popular as well. A: We have plans to make the Soviet Trio (Object 140, Object 430 and T62a) differentiate from each other, however, it is not finalized yet. Q: Will RNG will be reduce from +/- 25% to something lower? A: No, we understand skilled players want the game to be more predictable in terms of fighting against other players. However, we decide to keep the +/- 25% RNG in the game so players can have their “magical” and “fun” moments. For example, when you survive and carry the game because some enemy players “low roll” you. However, please do not assume it is pure +/- 25% RNG, the RNG is based on a normal distribution system where we can tune the probability, where there is at the moment it is set to have 67% chance within the +/- 10% RNG, where the extreme number has a smaller chance to happen. This was implemented some time ago. Q: Can you tell us what lesson you have learn from the previous sandbox? A: In the black tank case, they are meant to celebrate the American’s Black Friday. Back then, we don’t have much time to prepare for it (3 weeks). So, we decided to simply paint them black so we can get them ready on time for Black Friday (introducing new vehicles will means extra testing times and modelling for tanks as well). 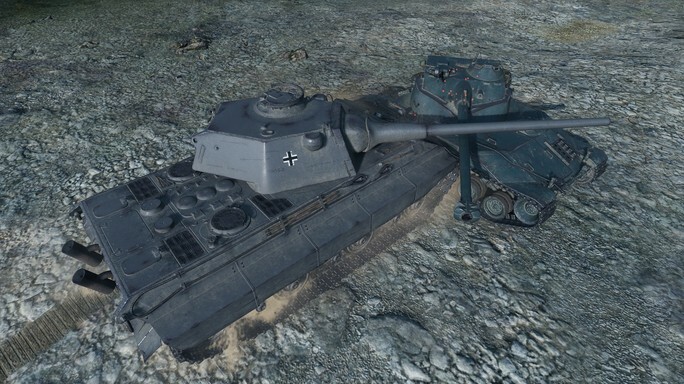 As using existing tanks with a different skin doesn’t affect the game balancing, we want to play safe at that time, but we wanted to make them as quick as possible. We will continue in the direction of accommodating towards different servers’ special events or seasons. Q: Will there be more unrealistic tanks for WOT PC in future? (e.g. Warhammer Tanks or similar to Nameless and Edelweiss). Players are quite upset about those tanks being in the game. A: I don’t think we are planning to create more of these tanks. The Valkyria Chronicles Tanks are originally created for Asia/Japanese players (or anime fans) for their collection – align with the idea of making special events for different servers. We are NOT going to sell these tanks in other servers. Q: People really dislike the “clown camo” (e.g. Patriot and Liberte), what are the developers’ option on this? A: This is a good question! We are creating a new customisation system for the games, where players can do further customisation for different tanks. Back when we introduced the Skorpion G, we actually created 3 visual variants. There is the normal Skorpion (with German Grey) and the Skorpion G that we all know. The last one is a very unhistorical/ unreal skin, which at the end was deemed unfit for the game. Q: What happened to the last year Christmas Loot box event? Will WG consider the loot box skin system implemented into the game like CSGO and Overwatch? Q: Can we implement something similar to the World of Warships supply containers? A: We like this idea. However, unlike World of Warships, which is a relatively new game comparing to World of Tanks. The supply container of World of Warships was implemented when they implemented the economy reform. For us, this is harder, as World of Tanks has its own legacy to considered. It is not easy to implement anything that can affect the in-game economy. If we are going to implement something that can potential alter the in-game economy flow, we will have to plan this very carefully. It can lead to unpleasant experience for players when they have decreased the amount of income from battle to compensate this, players will have a deception of making less money. Q: Will there be more variety in random battles? For example, night battle and weathers? A: If we are going to implement night battle and adding weathers, we need to decide will it be only cosmetic changes or this effects will affect the gameplay, such as lower view range for tanks during night battles and sandstorm etc.). They will also be carefully tested before we release them on the live servers. A: We are aware the XVM statistics part are leading grievance in the game, not only XVM focus. However, we cannot simply just ban XVM from the game. XVM also provided a number of functions on top of showing players’ statistics. We work closely with the XVM developers. Some people use to XVM statistics to plan their battle (e.g. following unicums into battles and as well as focusing good players on the enemy team – unfortunately). 2 years ago, we have collected statistics about XVM and we realise there are over 50% of the players uses XVM without the statistics functions. This is why we work hard to incorporate those functions into the game client itself, in the way of making XVM obsolete. Recently, we have introduced our new rating system, as we believe if we are able to make a better metric system, this will allow players to have a fairly accurate assessment of other players and comparison between players. At the sametime, Warmgaing did research about the options of not allowing third parties to fetch data from the WG API, it leads to a problem of data analysis for many useful services. We are working on it. Q: Can we hide players in battle? A: Unfortunately, we don’t think this is a good idea for the game. As someone playing without aware of the players on the enemy team can make someone feels he is playing against bots. It is also important for social interactions as well. You would not know who is in a clan or it can be hard for clans to attract players as well. Q: How’s is the grand battle doing? A: The grand battle map is a success in terms of balancing. Unfortunately, there are some issues with the matchmaking, as it clashes with rank battles (both game modes are tier 10s only). We are working on a fix on the matchmaking. Q: Artillery is annoying will they be remove or change further? A: Artillery will not be removed. The class is for people for like to predict another players behaviour. There is a proportion of the players that really like this class and some players only plays artillery. Now players can survive longer rather than being one shot by artillery. Q: Will the current engine limitation on 127fps be removed with the introduction of the new HD maps (graphic engine)? A: We are aware of the increasing usage of high end monitors (144hz and 165hz). The idea of the limitation with the 127fps is not because of the client itself, it is the due to the previous limitation of the Big World server engine. As mentioned before, the player client has been completely rewritten with our proprietary engine. The Server engine is also now being re-written and so such FPS limit is not needed. We are thinking of removing it or changing the FPS limit, it is in the stage of testing however this might not be changed in sandbox. Q: The camera overhang/ weird camera behaviour (e.g. the gun aim upwards when you quickly switch in and out of arcade mode when you have some kind of cover above your tank) is kind of annoying not only when testing the HD maps but also on live server, will they be fixed? A: We are aware of the issue, unfortunately we have no obvious solutions as of now. However, since the introduction of the “Pilsen” (Tank Factory map) we have tweaked the logics behind the camera direction. It helps with the situation but it is still not perfect. World of Tanks camera behaviour is far more complex than a normal FPS game (unlike FPS, WoT Tank camera also has to take many more factors into consideration, such as turret and gun traverse speed etc.) There is no simple solution as of now, but hopefully with future technology we will be able to solve this issue. There are players that suggest giving reference for the sensitivity settings, this has been noted and will be taken into consideration in the future. – However according to statistics collected by Wargaming, there aren’t many players that change the control settings. Fate of the Chieftain Mk 6. – unfortunately, it is unlikely for us to introduce the Chieftain into the game. As much as we want to implement to it into the game, we don’t want to just make it simply able to research from the Conqueror. If we can find some lower tiers that can fit to the similar playstyle to the Chieftain, then we will consider implementing the Chieftain into the game. Q: Will WG ever consider a Romanian tech tree? A: Unfortunately, we don’t think there is enough tanks for Romania itself to have their own tech tree. Q: When will polish tanks come? A: SerB is still working for us. He is NOT working on the moon base project, he is currently working on other Wargaming projects. A: We are sorry about the black tanks. As people knows, World of Tanks was very oriented to the CIS region. We really wa nt to change that, we want to pay extra attention towards different regions, not only CIS region. In the black tank case, they are meant to celebrate the American’s Black Friday.